On the 8th ministerial meeting of the China-Arab States Cooperation Forum, which was held in Beijing on 10 July 2018, Chinese President Xi Jinping announced that China would set up a China-Arab Countries Inter-Bank Association (CACIA) with a special loan of USD 3 billion. Two days later, Mr. Nadim Kassar, General Manager of Fransabank Group, signed the Declaration of CACIA on the inauguration ceremony and the first council meeting of CACIA. Along with Fransabank Group, National Bank of Egypt, BMCE Bank in Morocco and the First Abu Dhabi Bank (FAB) were also founding members of the CACIA. Mr. Hu Huaibang, Chairman of China Development Bank (CDB), Mr. Zhang Xuguang, Vice President of CDB, H.E. Mahmoud Al Amin, the Arab League Ambassador to China, H.E. Milia Jabbour, Lebanese Ambassador to China, diplomats from Arab countries and representatives from Chinese Ministry of Foreign Affairs also attended the event. Mr. Zheng Zhijie, President of CDB, stated that CACIA founding member selection criteria are outstanding business performance, market influence and willingness for cooperation and expansion. Fransabank Group was chosen to be a founding member of CACIA as “it is one of the most influential and reputable banks in the world”. As China's largest foreign investment and financing cooperative bank, CDB has played an active role in China-Arab pragmatic cooperation. Up to now, CDB's loan balance in Egypt, Oman, United Arab Emirates, Kuwait, Saudi Arabia and other Arab countries has reached nearly 8.5 billion US dollars, supporting a number of key projects in industries of petrochemical, telecommunications, finance and some more. CDB announced at the meeting that it will further increase its support through CACIA, providing the first phase of the US$3 billion special fund for China-Arab financial cooperation and US$10 billion reconstruction and industrial revitalization fund. 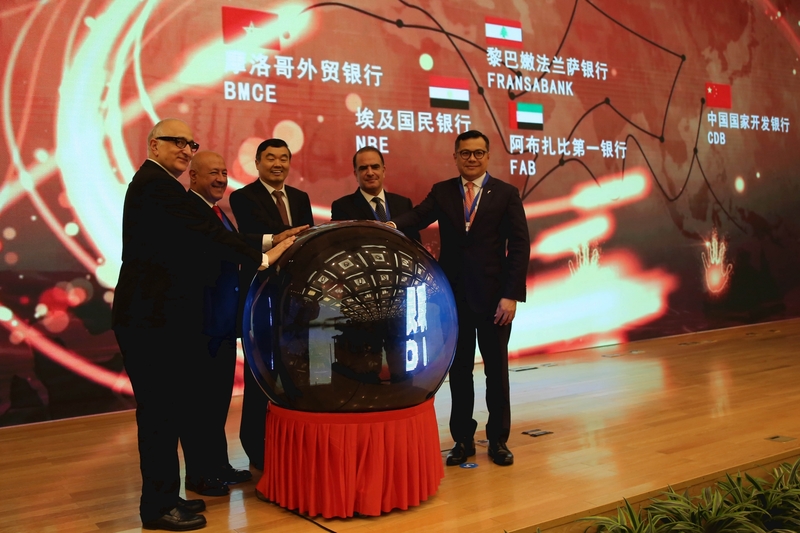 Chairmen of Fransabank Group, Adnan and Adel Kassar, who were the pioneers in building the modern ties between China and the Arab world, expressed great pride at having Fransabank chosen as a founding member of this important association. Chairmen Kassar indicated “We are delighted to be chosen by CDB as the only Lebanese bank to be the founding member of CACIA, which is an impressive recognition from the world’s leading development bank. Fransabank attaches great importance to its cooperation with the world’s leading financial institutions including IFC, EIB, EBRD, AFD/PROPARCO, and DEG of KFW group”. Chairmen Kassar stated that they believed the establishment of CACIA “will open a new chapter for the cooperation between Fransabank Group and CDB for jointly financing projects as well as bringing needed investments for key projects in Arab markets”. Chairman Adnan Kassar reaffirmed his commitment promised to President Xi Jinping when he presented him the China-Arab Outstanding Contribution Award in Cairo in 2016, that he would spare no effort to continue to push forward the China-Arab cooperation at all fronts. The video broadcast at the inauguration in Beijing showed photos of Adnan Kassar’s award ceremony with Chinese President Xi, as well as photos of Adnan and Adel Kassar unveiling the plaque of the “Adnan and Adel Kassar Silk Road Cultural Center” named after them by the Chairman of the Silk Road Chamber of International Commerce (SRCIC), in honor of SRCIC Honorary Chairman Adnan Kassar and Mr. Adel Kassar's great contribution to China-Arab communication and collaboration. The 7-story cultural center is located in the city of Xi’an, the ancient capital of China and the starting point of ancient Silk Road. The opportunities in the Arab world for Chinese banks and companies are enormous. CACIA comes particularly at an opportune time for China-Arab cooperation as Lebanese government just launched a US$20 billion investment program to improve the country’s infrastructure in April 2018. Besides, Lebanon has a unique offering to China. With its successful, influential and wide-spread Lebanese diaspora network across the world, Lebanon serves as a great platform for the overseas development of Chinese banks and companies. Fransabank Group was established in 1921 and listed first on the lists of banks in Lebanon. Fransabank is the first Arab bank that established a China Desk and becomes the first choice of financing partner for Chinese enterprises in markets of Lebanon, France, Iraq, the UAE, Algeria, Sudan and Ivory Coast, as well as Belarus.